JOHN S. HALL, a very prominent farmer of Pleasant Mound Township, Bond County, Ill., was born in Jefferson County, Va., within eight miles of Charleston, January 17, 1813. His present home is located on section 7, in Pleasant Mound, where he has a farm of four hundred and fifty acres and a house beautifully placed on a gravel bank in the midst of a natural grove. The father of our subject was Joshua M. Hall, a native of Jefferson County, Va., born in 1780. He was a farmer and also a boatman on the Potomac, and died in his native county at the age of fifty-eight years. His father was of English extraction and bore the same name as himself. The mother of our subject was Charlotte (Strider) Hall, and was a native of the same county and State as her husband. She lived to be but fifty-nine years old. Her father was Isaac Strider, a native of Germany, who was one of the early settlers of the State of Virginia. The family of Mr. and Mrs. Hall consisted of six children, all of whom grew to maturity, married, and reared families that are now scattered over the United States. Our subject is the third child and oldest son of his parents' family. He was reared and educated in his native place and received a common-school education. In 1831, he came to Bond County, Ill., and bought the farm where he now resides, but returned to Virginia in February, 1832, though in the following year he came back, traveling on horseback and by stage and river. In February, 1837, he married Miss Jane M., the daughter of Middleton Smith, who was also born in Virginia, in Morgan County. 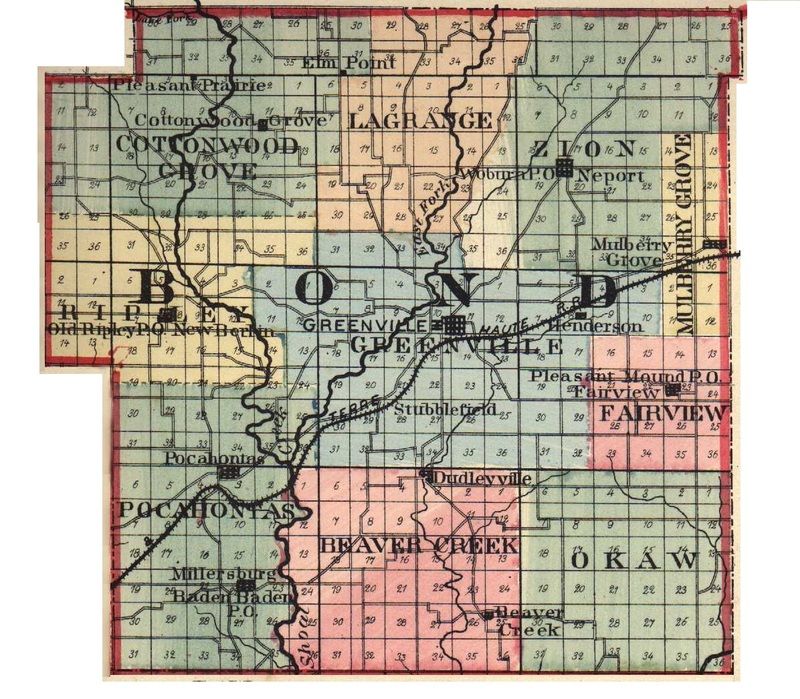 Mrs. Hall reached Bond County, Ill., in 1833, with her parents. Mr. and Mrs. Hall were the parents of eight children, of whom six were daughters and two sons. They are: Sarah V., deceased wife of Eugene Seymour; Mary O., wife of E. P. McMurran, who is Postmaster at Smithborough; Charlotte, wife of E. V. Gaskins, of Zion Township, Bond County; John S., residing near his father; Ellen A., wife of Thomas Milton, of Montgomery County, Ill.; William C., residing in Greenville; Emma, wife of O. E. Bennett, a commercial traveler; and Frances I., wife of Gilbert Guller, of Smithborough. All of our subject's children were born on the farm where he now resides, and they have all been happily married and he is now the proud grandfather of eight children. Our subject has a farm of four hundred and fifty acres, almost all of which is fenced and cultivated. When he located on this place it was all wild land, and it must be a great satisfaction to him to see how his efforts have been rewarded. Fields of waving grain and nodding corn have taken the place of the wilderness that first presented itself to his gaze when he made his trip here in 1831. He has found it most profitable to be a general farmer, and has made considerable money in the raising of fine stock. His first Presidential vote was cast for William Henry Harrison in 1836, and in 1840 he again voted the same ticket, and has been a Whig and a Republican ever since. He has held the office of School Director for a number of years. At one time he owned six hundred acres of land in the county, but now finds that four hundred and fifty are quite as much as he cares to manage. He is well known and is highly regarded as one of the old settlers of the place. Extracted 20 Dec 2016 by Norma Hass from 1892 Portrait and Biographical Record of Montgomery and Bond Counties, Illinois, pages 342-343.